Smith & Wesson (S&W), has agreed to acquire Battenfeld Technologies, Inc. for $130.5 million in cash. The acquisition is expected to close in December. In acquiring Battenfeld, S&W will become an industry leading in the sales of hunting, shooting, and reloading tools and accessories. Battenfeld markets dozens of popular products such as Tipton gun vises, Frankford Arsenal tumblers, Caldwell shooting rests, and Goldenrod safe heaters. Founded 22 years ago, Battenfeld Technologies has generated a largely organic* compound annual revenue growth rate in excess of 18% (Since 2006). 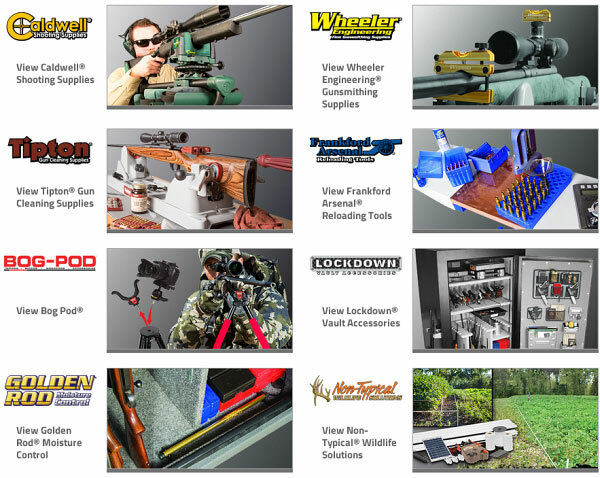 Based in a 145,000-square-foot facility in Columbia, Missouri, Battenfeld Technologies develops and sells shooting, reloading, gunsmithing, and gun cleaning supplies under several brands, including Caldwell, Frankford Arsenal, GoldenRod, Lockdown, Tipton, and Wheeler Engineering. Battenfeld grew rapidly by developing new products and by acquiring smaller accessories makers such as BOG-POD and GoldenRod. *Biz Terminology 101: Organic growth is the process of business expansion due to increasing overall customer base, increased output per customer or representative, new sales, or any combination of the above, as opposed to mergers and acquisitions, which are examples of inorganic growth. Share the post "Smith & Wesson Acquires Battenfeld Technologies"
If you want to build your arsenal of tactical rifles, here’s the Deal of the Decade. If you buy one large-caliber Armalite Rifle (.50, .416, .338, or .308 cal) you can get one FREE .223-cal AR-type carbine. That’s right, buy one rifle, and get one free. In fact, as a special added bonus, if you purchase the Armalite AR-50A1 .50 BMG National Match Rifle, you get TWO AR carbines. Buy one, get two free. These spectacular deals are being offered through Eurooptic.com, via phone-in orders only. You won’t find these offers on the Armalite or Eurooptic websites. You need to call (570) 368-3920 (and ask for Jason). NOTE: this offer is limited to supplies on hand. You snooze, you lose. 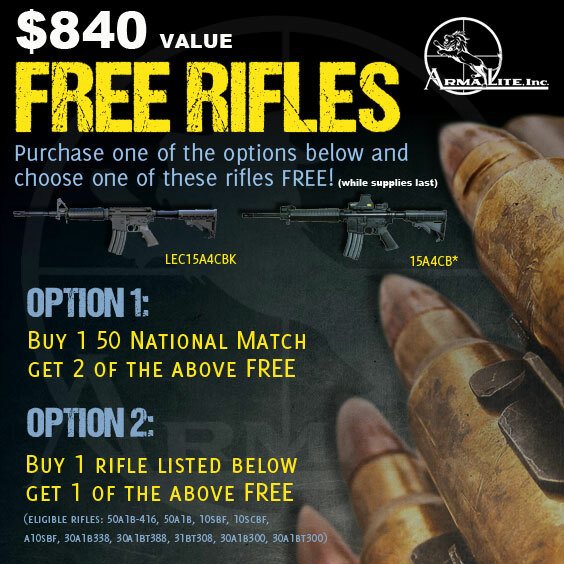 Option One: Purchase AR-50A1 National Match, receive TWO 223-caliber AR rifles for free: LEC15A4CBK and 15A4CB (optical sights NOT included). Yes — you get three (3) rifles total. Option Two: Purchase qualifying rifle and receive EITHER one LEC15A4CBK OR 15A4CB (optical sights NOT included). You get two (2) rifles total. 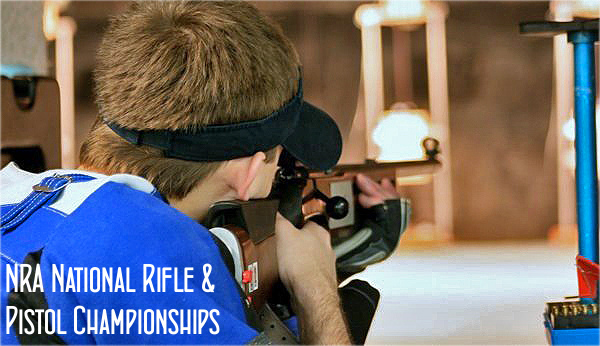 Qualifying primary rifle purchase: 50A1B-416, 50A1B, 10SBF, 10SCBF, A10SBF, A10SCBF, 30A1B338, 30A1BT338, 31BT308, 31BTC308, 30A1B300, or 30A1BT300. 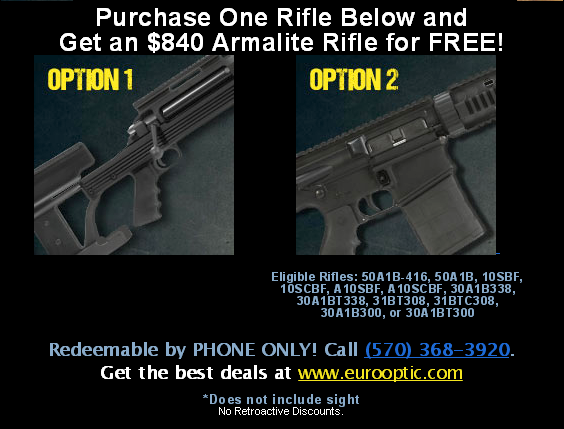 Share the post "Armalite Black Rifle Bonanza — Buy One, Get One Free"